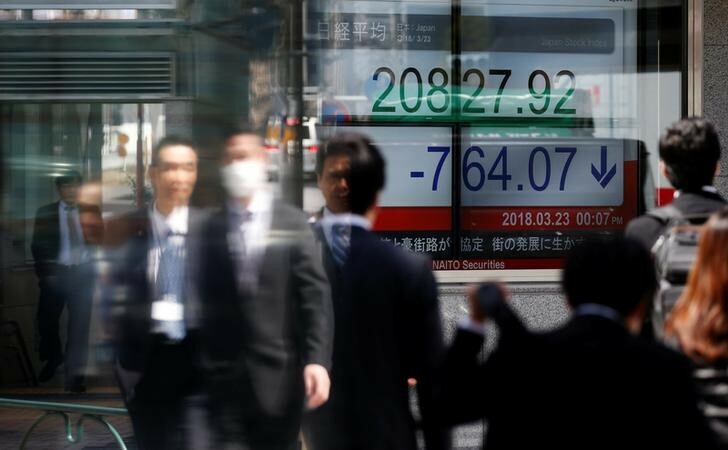 TOKYO (Reuters) – Japan’s Nikkei share average dropped on Friday as shares of automakers fell after Germany’s Daimler cut its profit forecast citing tariff concerns, while weak U.S. economic data dampened investor sentiment. The Nikkei (N225) fell 0.78 percent to 22,516.83. The index is down 1.46 percent this week. The auto index , down 1.58 percent, was the worst performer on the board.Daimler (DE:DAIGn) cut its 2018 profit forecast on fears of tariffs on Mercedes Benz cars it exports from the United States to China. Further, BMW (DE:BMWG) said it was looking at “strategic options” amid the trade dispute between the United States and China. Toyota Motor Corp (T:7203) dropped 2.66 percent, Honda Motor Co (T:7267) fell 1.97 percent and Mazda Motor Corp (T:7261) shed 0.73 percent. The Philadelphia Federal Reserve said its business conditions index fell to 19.9 in June, the lowest level since November 2016, from 34.4 in May. “The weak U.S. economic data and trade war headlines are all hurting the Japanese market’s sentiment and prompting a sell-off in blue chip stocks,” said Yoshinori Shigemi, global market strategist at JPMorgan (NYSE:JPM) Asset Management. Earlier this week, U.S. President Donald Trump threatened to impose a 10 percent tariff on $200 billion of Chinese goods while Beijing warned it would fight back. “People have started to seriously worry that the global economy will falter,” Shigemi said. Shippers also underperformed, with Mitsui OSK Lines (T:9104) declining 0.94 percent and Kawasaki Kisen (T:9107) falling 1 percent on concerns that shipping demand will decline due to falling commodity prices. Conversely, consumer goods makers, which are relatively immune to global woes, attracted buying. Cosmetics maker Shiseido Co (T:4911) rose 0.72 percent, Japan Tobacco (T:2914) added 1.07 percent and diaper maker Unicharm Corp (T:8113) advanced 1.9 percent. The broader Topix (TOPX) shed 0.33 percent to 1,744.83.